Chad W Smith's Home online: A New DS with bigger screens? A New DS with bigger screens? According to the rumor mills, (which I'm a bit late on picking up, apparently), Nintendo may be coming out with a(nother) new DS sometime this year. Being the proud owner, as I am, of the DS Lite - I'm not sure whether or not I want this to be true. On the one hand - having a bigger screen could be good. The screens are a bit smallish. But, at the same time - bigger screens with the same resolution means the images don't look as sharp. But even if you throw out the resolution debate - I'm not sure if I want my DS Lite to be outdated already. I mean I just bought the thing less than 8 months ago - and I bought it on launch day (in the US, anyway). This did get me thinking, though. If I were to redesign the DS - what would it look like? Then I'd have BlueTooth (so it could interact with the Wii, and with headsets, and keyboards, etc. ), WiFi 802.11a/b/g/n, a 3.1 MP Camera, a microphone, a better set of speakers, and both screens would be touchable. It would also play old GameBoy games. (Currently the DS/Lite can only play GBA Game Boy Advance games - not Game Boy Color or Game Boy games.) I would also have a SD slot and support media files (mp3, OGG, mp4, avi, mov, aiff, wave, aac, ra, rm, etc.) and NES/SNES ROMs natively. It might look a little something like this. Two touchable screens seems like too much to me... but it's just my opinion. I personally wouldn't mind a normal single-screened handheld with a screen a tiny bit bigger than the psp's. the whole "let's change the way you play!" thing isn't appealing to me. 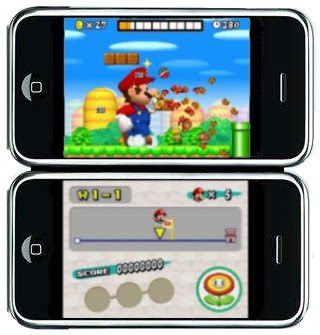 Nintendo's starting to act like apple "Lets make a "new" version of our product every few months!